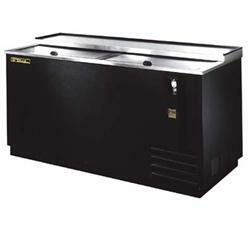 True’s refrigerated horizontal bottle coolers are designed with enduring quality and value. Our commitment to using the highest quality materials and oversized refrigeration assures colder product temperatures and years of trouble free service. Factory engineered, self-contained, capillary tube system using environmentally friendly (CFC free) 134A refrigerant. Sealed, cast iron, self-lubricating evaporator fan motors and larger fan blades give True bottle coolers a more efficient low velocity, high volume airflow design. This unique design ensures colder standard temperatures and faster recovery in high use situations. Condensing unit accessed from behind front grill, slides out for easy maintenance. Forced-air cooling. Positively guided air flow cools bottles on top first. Evaporator coil virtually runs length of cooler for balanced temperatures throughout the cabinet. Exterior - all stainless steel counter top and lids, heavy duty, wear resistant laminated black vinyl front and sides, matching black aluminum back. Interior - long lasting, heavy duty galvanized steel. Insulation - entire cabinet structure is foamed-in-place using Ecomate. A high density, polyurethane insulation that has zero ozone depletion potential (ODP) and zero global warming potential (GWP). Removable, bottle cap openers and cap catchers. Three (3) heavy duty, 10 mil thick pure grade PVC coated adjustable bin dividers to maximize storage. Evaporator is epoxy coated to eliminate the potential of corrosion. 21/2" (64 mm) diameter rail castors. 3" (77 mm) diameter rail castors. Ratchet locks and handles. Requires one per lid. Low temperature models hold 20°F(-6.7°C) for applications with high ambient temperatures. Designed for full alcohol beverages only [some low alcohol products freeze below 32°F (0°C)]. Remote cabinets (condensing unit ❑❑supplied by others; system comes standard with 404A expansion valve and requires R404A refrigerant). Consult factory technical service department for BTU information. All remote units must be hard wired during installation. FREE SHIPPING WITH IN NORTH CAROLINA, SOUTH CAROLINA AND VIRGINIA!